Sarcoidosis is a rare autoimmune disorder that can affect multiple major organs of the body. The skin is the largest body organ, and it is one of the common targets of Sarcoidosis. Sarcoidosis will behave much like other autoimmune disorders in which the outbreaks will occur in cycles. There will be months when no symptoms will be present and then there will be months when the symptoms flare up. The exact cause of Sarcoidosis is not known. Doctors think that it may occur when your immune system overreacts to an unknown toxin or other pathogen that enters the body through your airways. Some researchers think that Sarcoidosis may be hereditary. You may carry the gene for Sarcoidosis and an environmental trigger may cause this disease to activate. Studies are being performed to determine the causes and the triggers of Sarcoidosis. African Americans have a higher incidence of skin Sarcoidosis than Caucasians. This disease usually appears between the ages of twenty and forty. It is rarely detected in children. However, persons over fifty can be diagnosed with Sarcoidosis. 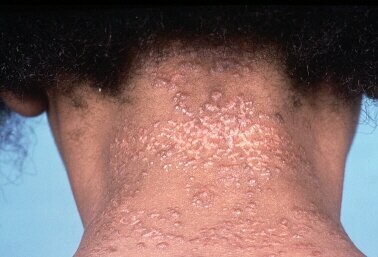 Skin Sarcoidosis will usually produce lumps, ulcers or areas of discolored skin. These areas on the skin may itch, but they dont cause pain. The areas of the body most affected by skin Sarcoidosis are the back, arms, legs and scalp. Occasionally there may be areas near the nose or eyes. The outbreak of skin ulcerations usually last quite a long time. Sarcoidosis can cause a serious skin condition called lupus pernio. This condition can cause disfiguring skin sores that affect the nasal passages, ears, eyelids, cheeks and fingers. These sores are very hard to get rid of and may return even after treatment is completed. The skin is not the only organ that Sarcoidosis can affect. It can affect other major organs such as the lungs, heart and liver. In rare cases, Sarcoidosis can be fatal. However, most of the time, treatment can help the flare up of this disease. The treatment for Sarcoidosis varies depending on the severity of the symptoms. The first line of treatment is usually corticosteroids. These are powerful anti-inflammatory drugs that can mimic the effects of the hormones that are produced by the adrenal glands. The corticosteroids must be used with caution because they can cause other complications when used long term. Some of the complications can include, weight gain, diabetes, osteoarthritis and an increased risk for infection. If a patient cannot tolerate steroid treatment, other medications may be used to treat Sarcoidosis. If you have been diagnosed with skin Sarcoidosis, it is important that you take good care of yourself. Follow your doctor's treatment plan and do not engage in any high risk behavior such as smoking or excessive alcohol use. Follow a healthy diet and get plenty of exercise. When you take good care of your body, you are giving it the ammunition it needs to fight off disease.